Clear goals and specific objectives will help us manage the challenges that face the watershed. 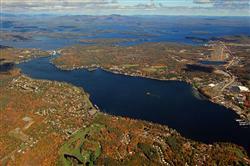 Successful management of the Lake Winnipesaukee Watershed will depend on the establishment of clear goals and objectives, and the identification of the means or techniques necessary to achieve them — as well as the long term commitment of community officials, residents, the business community, and visitors. The first significant plan that has been developed by the project partners is Plan 1: Meredith, Paugus, Saunders Bays Sub-watershed Management Plan. As future sub-watershed plans are developed for each embayment, they will be added to the web site under the Lake Management section. The final outcome will be a comprehensive Lake Winnipesaukee Watershed Management Plan, the implementation of which will result in achieving the goal of improving and sustaining the long term health of the watershed and the high quality water of Lake Winnipesaukee. Community officials and residents can implement a variety of techniques to manage nonpoint pollution inputs, referred to collectively as Best Management Practices (BMPs). Management techniques can include both regulatory and non regulatory approaches, and structural and non structural BMPs. The majority of the identified management techniques fall into three categories of activity; planning, education, and best management practices. Planning and educational activities are examples of non-structural BMPs. Best management practices can incorporate both structural and non-structural elements; a catch basin retrofit would be a structural action, but ongoing maintenance of the catch basin necessary to ensure proper functioning would be a non-structural best management practice. Managing stormwater runoff is the greatest challenge to communities. The objective of stormwater management techniques is to keep the water on site and infiltrate it as much as possible. The UNH Stormwater Center is an excellent resource for communities offering technical guidance on stormwater management strategies, on site demonstrations and performance evaluations of bmps, workshops, and publications. The Stormwater Guide is just one of the many valuable resources to be found here.